Harry is loving sewing at the moment, and it's something that I'm keen to encourage as it's something that I love too! These simple felt bags are a great first sewing project, and they can be filled with sweets to make a lovely Valentine's Day gift. The gift bag can also be reused from year to year. Felt is a great fabric for crafting with when children are learning to sew for the first time, because it is sturdy and easy for them to hold onto while they sew. You can also easily add the decorations using fabric glue. An A4 sized sheet of felt will make two gift bags. First fold the felt sheet in half by placing the two shorter sides together, then cut down the middle to create two rectangles. Keep the felt folded, and sew down each side to make the bag. We just used a simple running stitch in a contrasting colour, as I quite like the look of having the stitches visible. 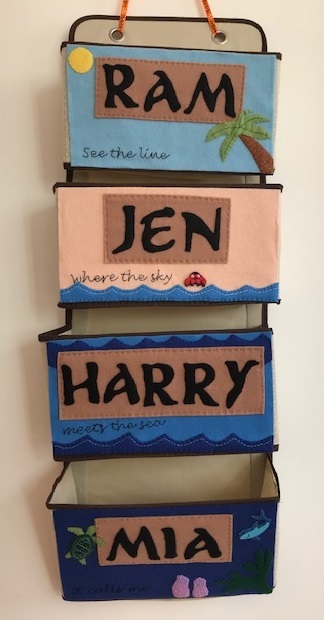 An older child might like to use a back stitch, and then turn the bag inside out so that the stitches are hidden and it all looks a bit neater. Harry used a thick cotton thread to do the sewing and reasonably sharp needle, under supervision of course. I think that he did pretty well considering that he's only just 5! For a younger child you could make the holes for them in advance and let them use a larger, blunt needle to sew up the sides. Or you could sew up the bag yourself and provide them with materials to decorate. We decorated the bag using coloured buttons and heart shaped pieces of felt. You could also add a name or initials to make it more personal for the recipient. We just glued the decorations on using fabric glue, but you could of course sew the decorations on to make the bag a little more hard wearing. 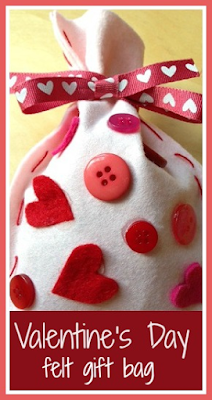 Fill the bag with small Valentine's sweets, and then use some pretty ribbon to tie the top closed. Something like this would also make a sweet little wedding or party favour. What a lovely project for a younger child and sewing is a great skill to develop. So pretty, and maybe simple enough for me to manage! Brilliant - they save LOVE all over! Very, very sweet! My little chap would love them!